We’d like to give some insight into Creative Mechanisms’ involvement in the development of a product that recently became available for sale. The product is Solewells (https://www.solewells.com/), a patented foot pad that acts as a second skin to protect feet from shoe caused friction and blisters. They are primarily intended to be used with heels, but can also be used with other types of shoes. This project was brought to us by a local inventor who had already filed for, and was granted, a patent for her invention. But the patent drawings and product renderings were not enough to start manufacturing. 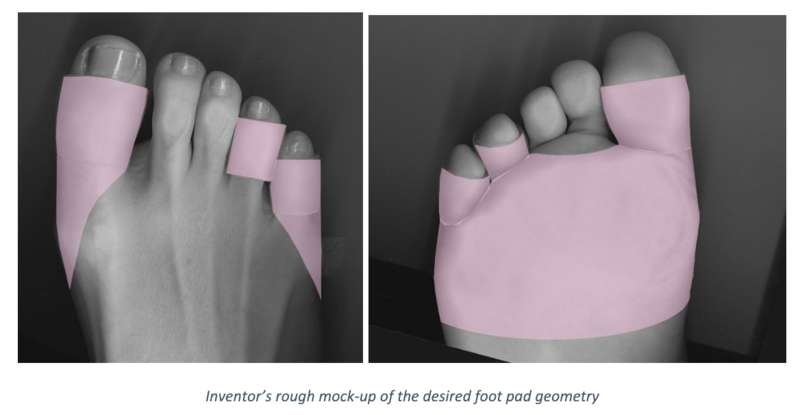 So, with the help of Creative Mechanisms and a lot of input and feedback from the inventor, the foot pad was sized appropriately, engineered for manufacturing, and prototyped for pre-production user trials. Our team could quickly tell that this inventor had already done her homework. She was knowledgeable about the methods and materials used for both prototyping and manufacturing. She also understood that getting the size and fit of the foot pad just right would take a number of prototype iterations. Creative Mechanisms started by sourcing an accurate virtual model of a woman’s foot in a high heel position. 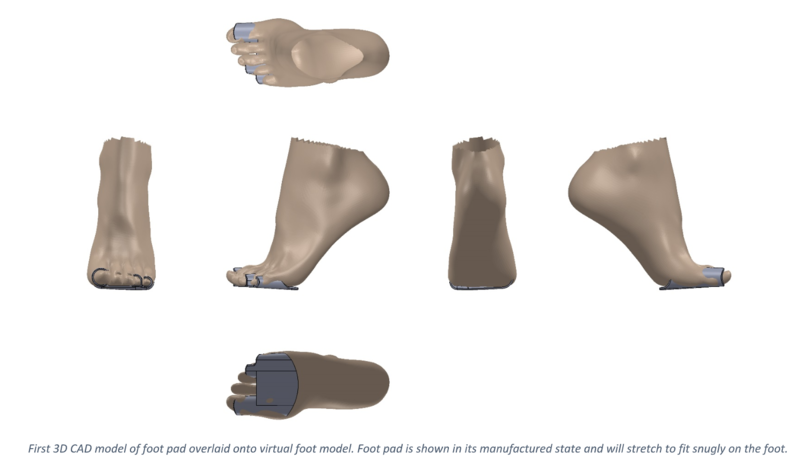 Using that virtual foot model as a guide, the first attempt at the foot pad was modeled in 3D CAD. The 3D CAD of the foot pad was adjusted based on the inventor’s insights regarding comfort, pressure points, and fit. 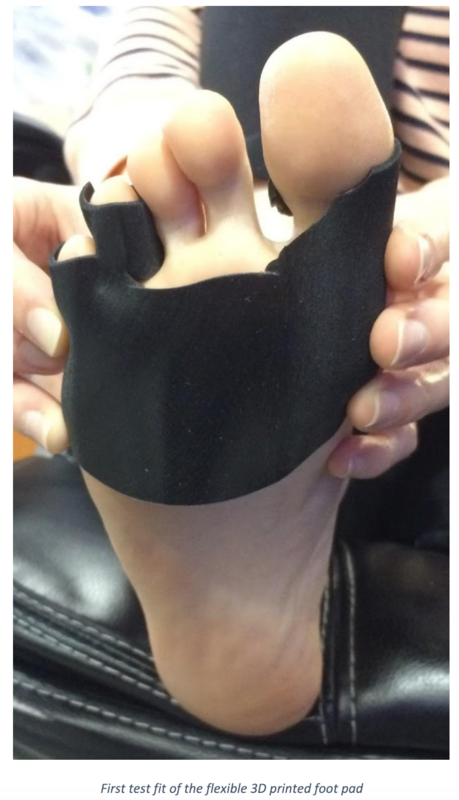 In order to test the foot pad geometry in real life, Creative Mechanisms started with a low-cost 3D printed flexible prototype model. This model was used to confirm overall size and shape. It also allowed the team to understand how the flexible product would behave when bent, something that is difficult to judge when working in 3D CAD. 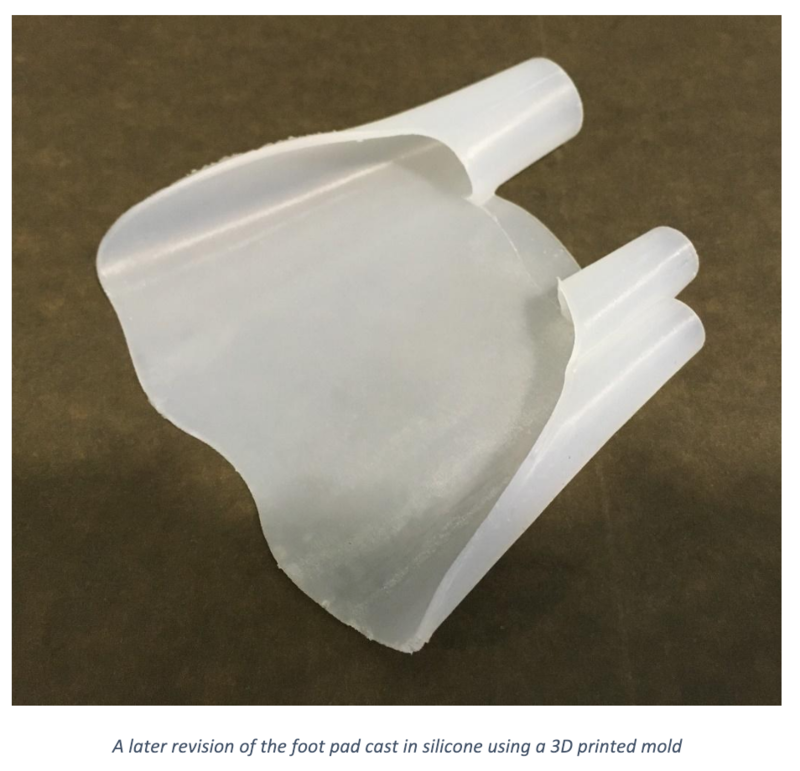 3D printed flexible materials typically do not have the same tear strength or elasticity as production-grade materials, so this type of prototype was not going to be a viable option for more rigorous testing. Some minor adjustments were made to the 3D CAD based on feedback gleaned from the 3D printed model. The next step would be prototyping in silicone rubber to better match the material that would be used in manufacturing. Silicone rubber is not 3D printable. 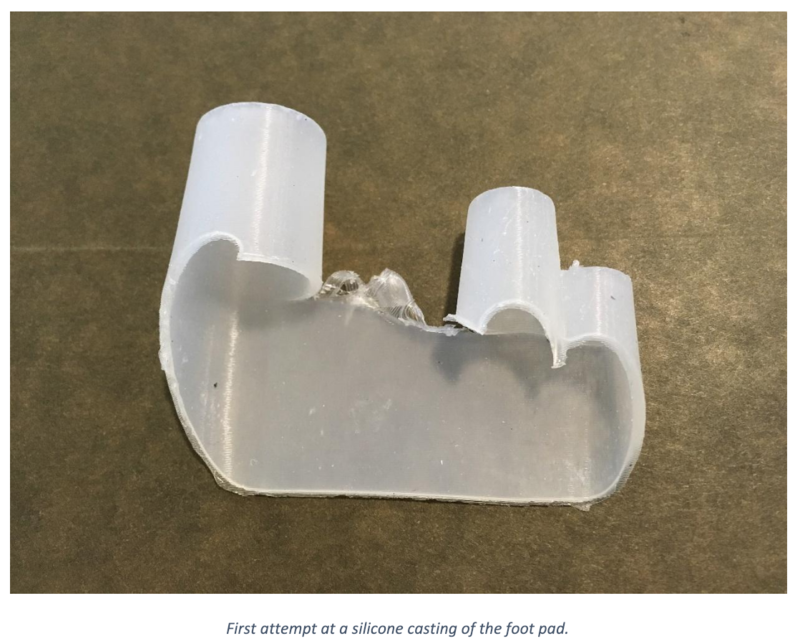 So, a hand-injectable liquid silicone casting rubber was used to fill a mold and create a prototype that could actually be worn and tested. With a completed cast silicone prototype model of the foot pad, the inventor was able to test it with heels and provide feedback. About 6 rounds of iteration were done, each involving adjustments to the 3D CAD, cast silicone prototype models, and comfort testing. 50 sets of silicone parts were cast to be used in a consumer trial. Based on feedback from consumers in the trial, some minor tweaks were made to the 3D CAD. With the fully-engineered and ready-for-tooling 3D CAD file, the next step was finding a manufacturing facility that could create production-grade tooling and manufacture the foot pads. The mass-produced parts are manufactured in clear flexible material so they appear almost invisible when worn. The foot pads can also be trimmed by the consumer depending on the shape of their feet or shoes. Please visit Solewells to learn more about the product and to try them for yourself.